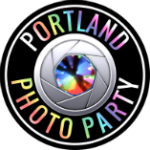 Portland Photo Party is the premier photo booth rental service and green screen entertainment service in Portland. We create high quality photo entertainment experiences for Weddings and private parties. We also combine innovative branding and social media marketing for a wide range of corporate events. Whether you choose our spacious enclosed photo booth (fits 15 people!) or our open-air photo lounge, you'll get the most innovative photo entertainment on the market. Your guests will have a blast with our fun props, special effects filters, video and instant Facebook sharing. Learn more. We'll design backgrounds themed and branded to your party -- and then we'll insert your guests into the scenes. It's creative, interactive and fun! Learn more.